Every building has a main pipe that connects it to either the city sewer system or a septic tank. The most common indicator of a faulty sewer or septic line is a clogged tub drain or toilet. And though some clogs can be broken up by plunging or snaking the drain, issues that are farther down require a plumber with special knowledge. John’s Plumbing & Pumps, Inc. delivers expert knowledge and professionalism no matter where the problem has occurred in your sewer or septic drain. By using advanced technology that makes it easy for us to locate the issue, we help you find answers fast. Our company has been around a long time and has a wealth of experience in Yelm and the surrounding areas. This experience has earned us respect and a lot of welcome business. And because of this, we are fortunate enough to be able to carry the highest-quality equipment and replacement parts so you don’t have to think twice about the work you pay for. There are two types of main line drains – sewer or septic. And owners are highly aware of whether their property is connected to one or the other. 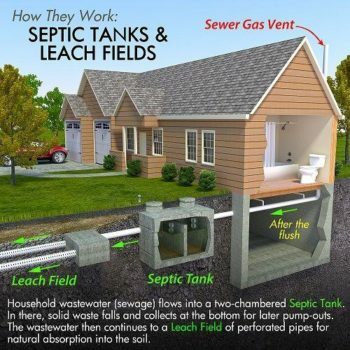 If a home is connected to a septic system (most of which are known as a gravity system, including a drain field and holding tank), they have the advantage of not having to pay city sewer fees. However, Washington residents are responsible for emptying and cleaning their tank every three to five years. Both systems require professional plumbing services to help keep pipes and drain systems working properly, fixing leaks, breaks, and clogs in the pipes, as well as optional weatherization work. Without our services, a faulty line could lead to a backup of wastewater in the home, pooling in the yard, and serious health and environmental hazards. So, don’t hesitate to call us if your sewer or septic drain needs the immediate attention of a licensed plumber. Secondary drains refer to shower drains, sink and dishwasher drains, and floor drains. They all lead to the same, main line drain that carries waste water away from the property into a septic holding tank or city sewer where it’s treated. If the issue occurs in a secondary drain, costs and work involved tend to be much lower. However, if there is a blockage or damage in the main line, it interferes with every secondary drain and could mean not only a higher price tag but the inconvenience of your home or business’s water system being put on hold. John’s Plumbing & Pumps responds to every type of septic or sewer drain issue promptly and with an approach that puts the property owner first. We offer financing options so you don’t have to worry about upfront costs or other complications related to covering parts and labor. Our licensed plumbers also help you care for your system so you don’t have to worry about repeat incidents. Do the work to keep your drain clear. Call a plumber for drain cleaning, or use a snake. Chemical drain cleaners only exacerbate the issue.